Native Instruments KORE is a new product a lot of us can’t wait to get our hands on. By providing a unified interface for working with soft synths and effects, KORE promises to create a whole new product category: it’s a universal catalog for all your sounds, a universal host, a universal control mechanism for adjusting sounds, in performance and in the studio. But it’s also likely to be a tough sell for Native Instruments, since it isn’t quite like anything previously in the marketplace, and it doesn’t do much if you don’t already have a library of plug-ins. NI has been slowly teasing out some of the specific details through the month on their Website, but this week they finally released what we all want to know: how much does it cost? The answer is now official: US$579 / EUR 499. Now, it does come with a unique USB2 audio interface and control surface, but that poses a challenge: most of you with enough soft synths to want KORE probably already have an audio interface. As for loading up on instruments for use with KORE, NI has a set of special offers. You’re in luck if you just bought an NI Komplete product: you’ll get something for free, from sounds to upgrades, depending on what you own. 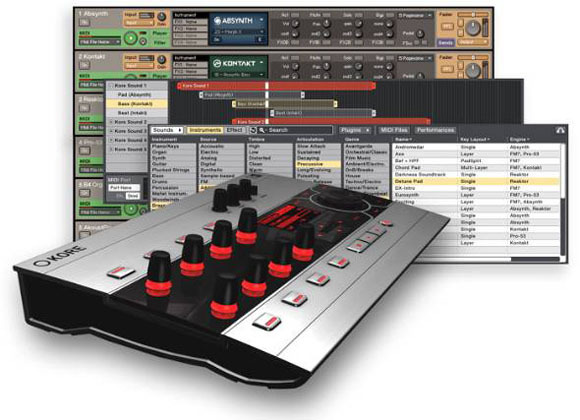 Everyone else gets a slight discount on Komplete, the “everything in one box” from NI; it’s $1149 instead of $1499. Now the bad news: the offer ends June 6. That raises some serious questions that I hope NI will answer between now and KORE’s May 8 ship date. At NAMM, NI touted this as a solution for everyone, as a new sound platform that even third-party developers would embrace. But it looks to me like they’ll have an uphill battle getting fast adoption given that KORE costs $579 and doesn’t include any soft synths to get you started, while likewise Komplete includes all the soft synths you’d want to use with KORE, but doesn’t include KORE itself. Keep in mind that KORE will only work with plug-ins, not the built-in synths in software like Logic Pro and Ableton Live. If NI were using this to push their own line of instruments, that might make some sense, but after June 6 will you really have to spend $1499 + $579 list to get the full NI line with KORE? I personally think that’s a great deal compared to the value of a $2000 hardware synth, but it’s tough to get music consumers to see it the same way, especially as software users traditionally opt for soft synths as a way of economizing. Remember, $600 list normally buys you a full DAW with sequencing and audio recording features; it may strike consumers as steep for this “super-host.” Real value aside, perception of value is what determines success. This is not a product review, and I’m still very excited to try KORE from what I’ve seen. Personally, I think if it’s good enough, it’ll easily be worth the price. But I do think pricing and marketing are important factors, too, issues independent of product reviews, and I honestly hoped for something more aggressive from NI. Why not start bundling KORE with Komplete, or include a small sampling of Komplete’s synths (like the Xpress line, for instance) with KORE? Unless they’re planning on selling only to people who own Reaktor or several NI synths, I’m a bit confused. Part of KORE’s success will depend on the number of units NI is able to sell, because their own claim is that they’re building a platform, not just a product. We already saw how cool KORE was at NAMM, and in the month of March in their product details, but it seems that NI may have missed an opportunity at Messe to explain how they’ll sell KORE, the platform. It’ll be interesting to see how this pans out. In the meantime, I can’t wait until this ships in May.